On a warm summer day in 1955, fifteen domestic workers– maids, cooks and chauffeurs– packed into a small apartment in a Hartford public housing project. It was a Thursday, the one day of the week they were granted off by their employers. They came to hear a trim young man, thirty years old, dressed in a coat and tie. He was Malcolm X, formerly Malcolm Little, a small-time criminal who remade himself into a minister for the Nation of Islam (NOI). Malcolm had just established a house of worship in Springfield Massachusetts. He was about to do the same in Atlanta, Georgia. But he stopped in Hartford because a woman who had traveled to hear Malcolm speak in Springfield was so impressed that she invited him to speak in her city. This he did, talking to working class members of the Black community who made up the majority of the NOI around the country. The Hartford group soon grew to forty people, and by 1956, Malcolm X had founded Temple No. 14 in the city’s north end at 2118 Main Street. He spoke to new recruits about the religious tenets of the NOI, but his topics also extended to the international stage and the organic links between Black populations everywhere: “The Black man is rising up all over the world and now countries are starting to think before starting a war,” he told the mosque crowd. Many of these uprisings had been taking place in Africa: Ethiopia, Kenya, Algeria. Malcolm wove the stories of Black struggles against white racism at home with the fight against white colonialism abroad. He returned to Hartford at least twice in January, 1957. By this time, the FBI and its local office in New Haven was tracking and recording his every move. The bureau files that have been publicly released provide the most accurate record of Malcolm’s itinerary. Temple No. 14 was so active that on April 28, 1957, Nation of Islam members from Hartford were asked to join Malcolm in Harlem. He organized a show of force in response to the beating of a local Muslim who had witnessed police attacking another man on the street. When the witness tried to stop it, he too was severely beaten by the cops and hospitalized. Militant protests against police brutality were rare; this one elevated Malcolm as a national figure. Temple 14 moved to 1097 Main Street, where Malcolm spoke in August, 1959: “We do not advocate violence but we do not turn the other cheek either,” he told his listeners. “When you kill a snake, that is not hate. You are merely protecting yourself.” The next month he narrated a home movie about his first trip to Africa for the Hartford temple members. All during this period Malcolm was tailed by police and federal agents: Detroit, New Jersey, Florida. Malcolm spoke and the FBI followed him: Chicago, Boston, Cleveland. He knew he was being watched. In answer to a question about the Vietnam draft, Malcolm replied that he wouldn’t tell anyone to become a conscientious objector because he knew the government was listening. He would, however, personally refuse to be drafted, Malcolm declared. Although Malcolm X spent a lot of time in Hartford, he also accepted invitations to speak at Connecticut college campuses. He addressed Wesleyan University in February, 1962. An informant reported “there was no disorder whatsoever and he was well-received by the students.” He was also invited to speak at the University of Bridgeport. Listening to Malcolm X was often a transforming moment for African Americans, and sometimes for whites as well. It was on June 5, 1963 that Malcolm spoke to his largest Hartford crowd, 800 people at the Bushnell Memorial Hall. The event was sponsored by the University of Hartford. According to African American writer J.K. Obatala, the speech was the moment when he was inspired to travel to Ghana, his ancestral homeland. “It takes a trip to Africa to realize how American we are,” Obatala wrote. Only four months later, on October 29th, Malcolm X spoke to 700 at the University of Hartford. The speech was moved outside to accommodate the overflow crowd. It was a chilly autumn afternoon, which inspired Malcolm to quip “maybe what I say will make you hot.” In contrast, a representative of Dr. King’s Southern Christian Leadership Conference (SCLC) gave a talk that same day which attracted only thirty people. In 1963 the freedom struggle was burning hot; racist forces in the South were carrying on a terror campaign of intimidation and violence. In June, Mississippi civil rights organizer Medgar Evers had been murdered in his front yard. (Meredith’s killer was not prosecuted and convicted until 1994.) Hartford reporters, however, seemed more interested in Malcolm’s disagreements with other national Black leaders. Malcolm warned of “racial bloodshed” that was coming to America. He was assassinated in Harlem on February 21, 1965, three months before his 40th birthday. Thousands of pages of FBI files on Malcolm are still classified, so we may never know the entire extent of the forces that conspired to murder him. Most of white America did not know what to make of Malcolm X, except to fear him. During his short life, he did his best to tell the truth despite the consequences. He challenged the racist political, economic, and cultural institutions of the United States. Maybe that’s why the white community in the 1950s and 1960s was so terrified of this convict-turned-leader. 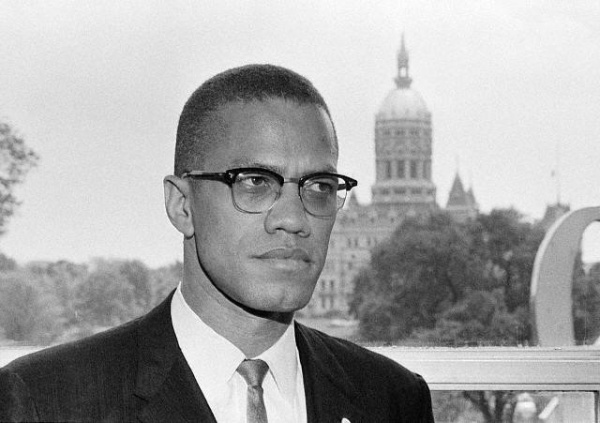 Like Nat Turner before him, and the Black Panthers after his death, Malcolm defied all the stereotypes of how oppressed people should behave in the quest for their own liberation. If memory serves, I saw Malcolm X debate Reverend Richard Battles at the Bushnell in the Summer of 1963. While siding wholeheartedly with Battles, I could not but be lastingly struck by Malcolm’s power and genuineness.